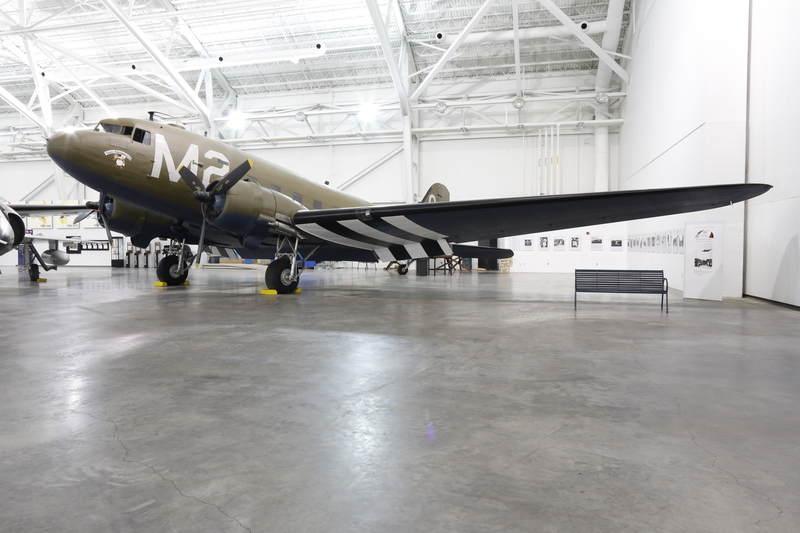 NUMBER BUILT : Douglas built a total of 10,047 C-47s and derivatives. This does not include 149 civil aircraft impresses before delivery. Powerplant: Two Pratt & Whitney R-1830-92 Twin Wasp, 14-cylinder radial air-cooled engines, 1,200 horsepower each. Weight: Empty 16,970 lbs., Maximum takeoff weight 26,000 lbs. Dimensions: Wingspan 95′, Length 64’5″, Height 16’11″. Performance: Maximum speed 229 MPH at 8,500 feet, Cruising speed 185 MPH at 10,000 feet, Service ceiling 24,100 feet. The first DC-3s were ordered by the USAAF in 1941 under the designation C-47, but there was no way to predict that simple designation would become a legend, that over 10,000 would be built and that the plane would be listed by General Dwight Eisenhower as one of the four pieces of equipment “most vital to our success in Africa and Europe.” There were countless modifications to the C-47 fleet, some taking place at the factory and some in the field. There were VIP transports (designated VC-47A/B) and there were SC-47s used as search and rescue aircraft. Several C-47s were fitted with pontoons and redesignated C-47C. There were trainer versions designated TC-47 and reconnaissance versions designated RC-47. After World War II the C-47s were used in the Berlin Airlift, the Korean War and the Vietnam War. Many DC-3 and C-47s are still in operation, nearing the end of their first half century of service and looking like they could go another half century. On 7 July 1971 SAC’s last C-47 was transferred to the USS Alabama Monument Commission. This VC-47D had been assigned to the 97th Bomb Wing, Blytheville Air Force Base, Arkansas. Since its organization on 21 March 1946, SAC had continuously used C-47s’ or “Gooney Birds” as they were usually called, for support and administrative purposes.